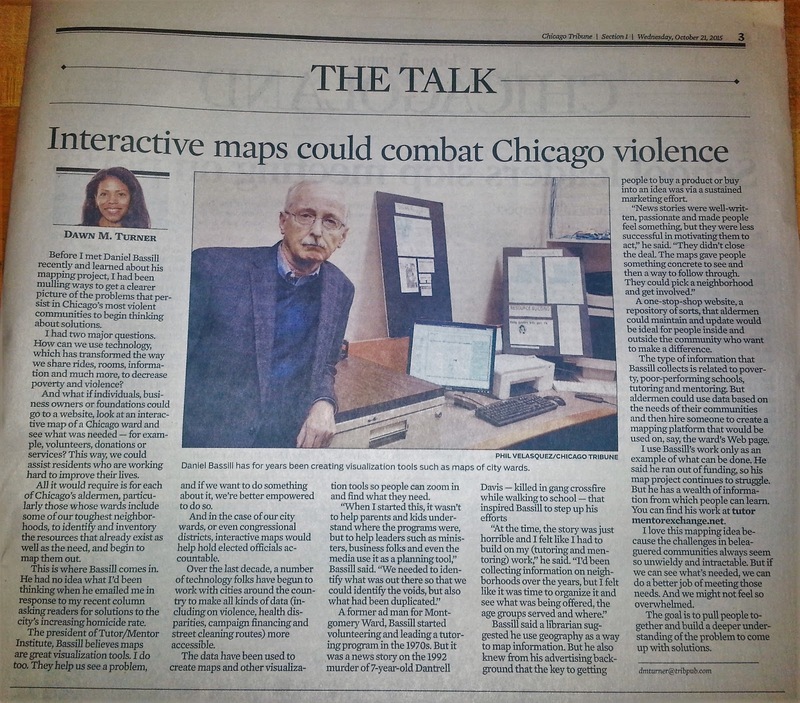 Last week's on-line verions of the Chicago Tribune, included a column by Dawn Tice Turner, titled "Interactive maps could combat Chicago violence". This featured the mapping strategies I've tried to develop since the mid 1990s. Read more on the Tutor/Mentor blog. 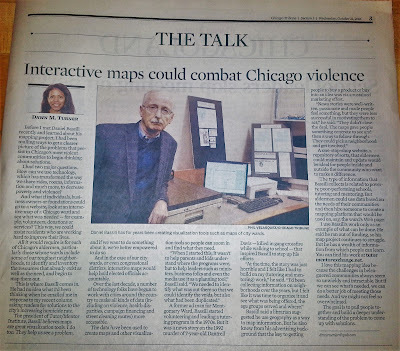 Today, 10-21-15 the Chicago Tribune used page 3 to share Dawn Turner Tice's story from last week. 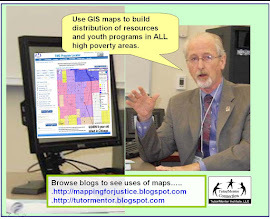 Browse through all of the articles in this section of the Tutor/Mentor Institute, LLC web site to see ideas for using maps. Connect with me on LinkedIN, Twitter or Facebook if you'd like to help develop this capacity. Yesterday's mass shooting in Oregon has led to a wave of new stories showing mass shootings in the US, prompting front page headlines. 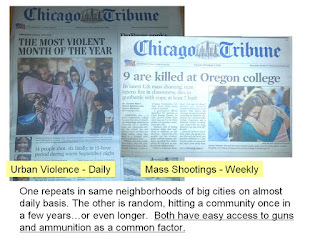 At the same time, constant violence is generating front page headlines in Chicago. Are these the same? Should they be discussed in one big conversation? Or are there different root causes, which need to have in-depth conversations? What information is available? My Facebook and Twitter feed are full of stories about the mass shooting in Oregon, pointing out how this has become an epidemic across the USA. A few sites are using maps to show where these incidents have taken place. This Mass Shootings in US since 1966 report is one. Here's an analysis of data on this map, from the MotherJones site. Here's another site with a good analysis of mass killings. Note that both of these map analysis reports do not focus on gang involved shootings/killings. I looked for maps showing gang involved shootings in the US. Here is a WBEZ map analysis showing gun violence in Chicago from 2002-2012. Here's another site that seems to include both mass killings and gang related gun violence across the country. If you are motivated to get more involved, visiting these sites, then inviting friends, family, etc. to also visit the sites, would be a good start. 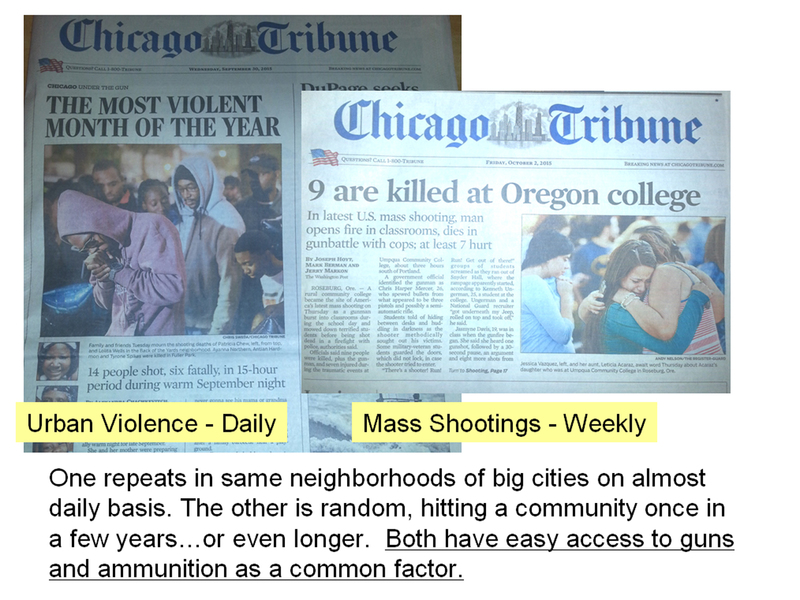 While mass shootings hit randomly in different towns/cities, they do not occur daily in the same town/city the way shootings do in Chicago and other cities., While access to guns is a common factor, root causes and possible solutions may differ. Can you point to web sites where these similarities and/or differences are being discussed? I collect and archive information like this on blogs and in the Tutor/Mentor Connection web library so that others can read and begin discussion causes and solutions without needing to do the searching for articles. 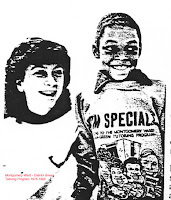 I support volunteer-based tutor/mentor programs that engage adults who don't live in poverty because those adults are a form of bridging social capital that can open doors to aspirations and opportunities beyond what urban youth see modeled every day in their own neighborhoods. However, I also view these programs as a strategy for engaging adults who don't live with the same daily challenges, such as daily shootings that terrorize even those who are not the targets. Unless we find ways to engage more people on a personal, self-interested level, I don't think we'll ever generated to public will to build sustained, long-term solutions to urban poverty, and urban violence. I think the mass shootings plaguing the country have a different root cause, and possibly, a different set of solutions. What they have in common is an easy access to guns and ammunition. Take that away and the conversation is different. 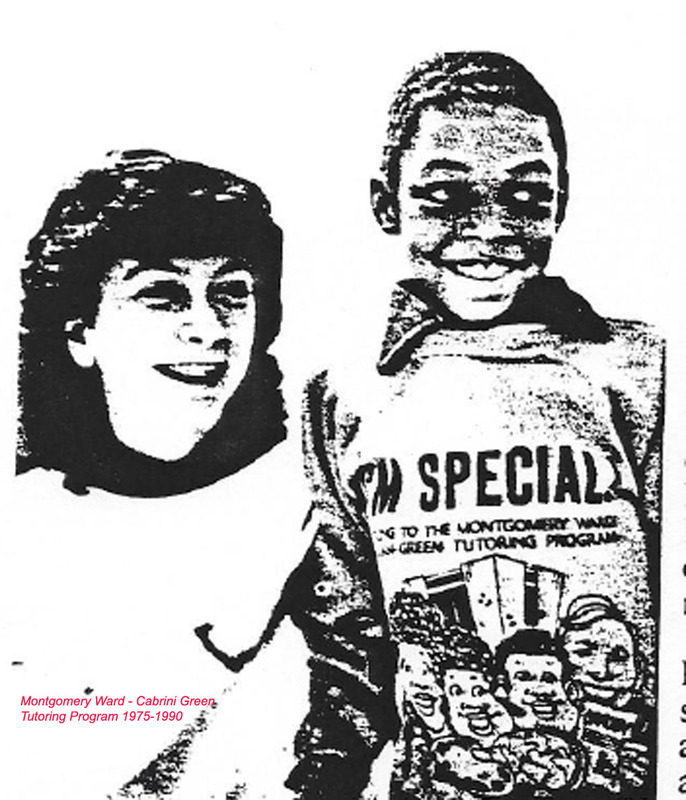 This blog, and the Tutor/Mentor Blog, are primarily focused on helping mentor-rich, non-school, volunteer-based tutoring, mentoring and learning programs grow in areas of high poverty. By "grow" we mean first, there needs to be some organizational structure/team that operates a youth program in an area of the city and suburbs where such programs are needed. Second, we mean such a program is able to attract talent and resources, and is constantly learning from its own results, and from what others share on their own web sites. Third, such programs engage youth, volunteers and community members in on-going efforts to understand WHY such programs are needed, and WAYS the program and its members can help the youth in their programs move more successfully through school, and into adult lives. That means we want the result of what we do to help kids be working in jobs with livable wages once they are entering their mid-twenties. There are many stories on the Tutor/Mentor Blog that point to information related to these goals. 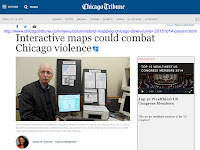 Most of the stories on this blog focus on uses of maps to make sure programs are available in all the neighborhoods where they are most needed. Many stories also show uses of concept maps, as a tool for communicating ideas and strategy. Below is one resource that we've made available to planners. In this pdf the number of youth, age 6-17, who are under the poverty level, are shown. Thus, if a neighborhood has 1000 kids in poverty, it might need 20 tutor/mentor programs that each serve 50 kids to serve 100% of those kids. That's not a realistic expectation, but having no programs or just a few, is an undesirable level of program availability. If you follow the links on the side of this blog, and scroll through stories written since 2011 you'll see that I point to other mapping platforms. 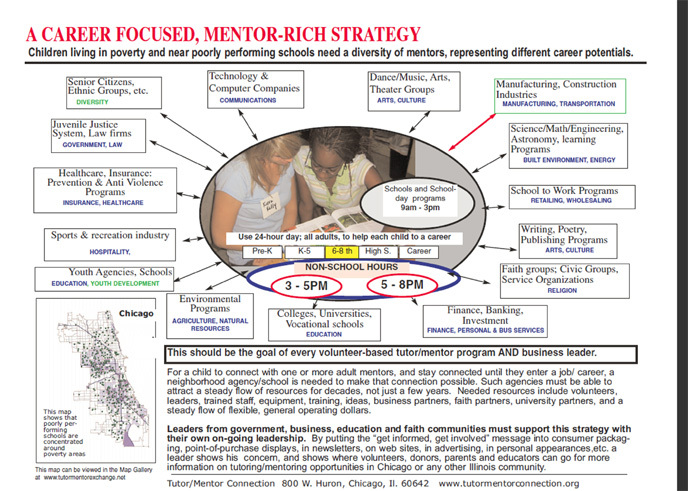 The Program Locator that the Tutor/Mentor Connection created in 2008 only shows known tutor/mentor programs, and uses poverty data and school performance information to show indicators of where programs are needed. It also has a section showing assets, such as banks, drug stores, faith groups, colleges and hospitals, who could be part of neighborhood planning groups in different community areas. Unfortunately, I've not been able to update this since 2010, and recently error codes on the database make the site un-usable. I'm looking for help to fix this. That means the other mapping platforms I point to need to be used to create map stories showing where tutor/mentor programs are needed, and you'll need to add your own information showing existing (if any) programs already operating. The Chicago Programs Links library is one resource you might use to identify programs you could add to your map. I keep finding new mapping resources. When I do, I write a blog article, like I am now. And also add the resource to this section of my web library. Today I was browsing through the Quality of Life Planning section on the LISC-Chicago web site and found this Chicago Neighborhoods 2015 page on the Chicago Community Trust web site. This points to a City of Chicago’s 2013 Citywide Retail Market Analysis, which divides the city into 16 business districts. For each district there is a map, along with demographic and business data. Community planners could use these maps, along with my maps, and map views created using other platforms, to build a case for more non-school tutoring, mentoring, learning, jobs and recreation programs, along with a strategy of engagement, identifying assets and leaders who need to be involved in building on-going visibility and a consistent flow of funding to the neighborhood, to support the growth of all of the organizations that planners show are needed. If you know of other resources like this please share. More importantly, if you know of ways communities are connecting on-line for deeper learning and more frequent interaction, complementing the on-the ground planning and traditional meetings, share that information, too. If you're an organizer, or a teacher, I encourage you to use stories like this to stimulate discussion of work that needs to be done to make neighborhoods safe and great places to raise kids and build families.